R. heckeliana Tratt., Ros. Monogr. 2:85 (1823). Low-growing shrub 0.l-0.6(-l.5) m, many-branched, ± twisted with creeping underground stems. Cortex of young shoots ± pubescent. 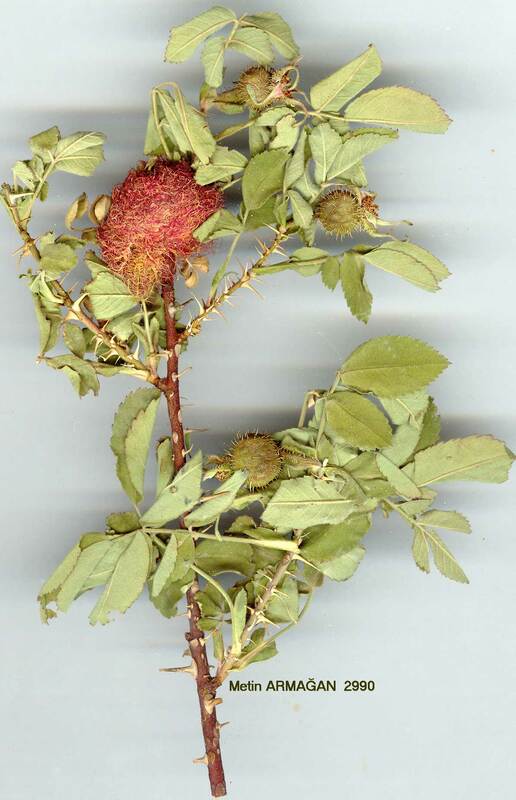 Prickles straight or slightly curved, up to 1.1 cm long, thin and bristle-like, ± uniform, often ascending, often pubescent at least on young branches, sparse. Leaflets 5-7, elliptic to suborbicular, 1-7 x0.8-3.7 cm, acute to obtuse or retuse, with a rounded to cun-eate base, shortly adpressed-pubescent or velutinous, usually eglandular, pale greyish-green, usually uniserrate, teeth distinct; rachis densely pubescent, ± prickly and with stalked glands; stipules broad, pubescent, entire or glandular-serrulate, auricles diverging. Flowers solitary or 2-3 together. Pedicels 0.5-1.5(-3) cm, densely pubescent and often with some stalked glands. Outer sepals usually lobed, narrowly ovate with a long narrow apex dilated above, 1-2.5 cm, eglandular or with sparse glands on the back, ascending to erect after anthesis, persistent until the fruit matures. Petals 1.1-1.5 x1-1.2 cm, usually pale to deep pink, rarely white, often persistent after anthesis. Styles lanate, stigma-head compact, semiglobose, almost as broad as the narrow, ± concave disc, orifice wide. Hypan-thia subglobose to ovoid, up to 1.5 cm diam., smooth or usually densely setose, setae often long, not very stiff, glandular or eglandular, dull to scarlet red. Fl. 6-7. In scrub or open places on rocks, slopes and screes or at wood edges, usually on limestone, 1300-2900 m.
subsp. orientalis (Dupont) Meikle in Kew Bull. 19:229 (1965). Syn: R. orientalis Dupont apud Seringe in DC, Prodr. 2:607 (1825); R. armena Boiss., Fl. Or. 2:674 (1872)! R. villosa L. subsp. orientalis Keller, Syn. Ros. Eur. Med. 243 (1931). Ic: Schneider, I11. Handb. Laubh. 1:548, 552 (1905) as R. orientalis. Type: a specimen cultivated in Hort. Dupont; originating from Iran. S. & Inner Anatolia. A8 Gümüşane: Bayburt, 1862, Bourgeau (type of R. armena)! B5 Kayseri: Aslan Da., Bal. B6 Sivas: 14 km N. of Sivas, 1350-1500 m, Sorger 69-49-131! B7 Elaziğ: Harput, Buslu-tasch, Sint. 1889:643! B8 Bitlis: slopes below the summit of Kambos Da., 2300 m, McNeill 628! C4 Içel: 43 km N. of Mut, 1600 m, Sorger 66-34-59! C5 Niğde: Bürücek, 1670 m, Balls 1286! C9 Mardin: Halaka Da., above Gezirit-ibn-Omar (Cizre), 2300 m, Nábelek 1837. N. Iraq, N. Iran. Ir.-Tur. element. Forms intermediate between the two subspecies occur as follows: B7 Erzincan: Kainer Da., Egin (Kemaliye) to Arabkir, 1520 m, Sint. 1889:890! (with subsp. orientalis). B9 Bitlis: Nemrut Da. crater, B. Post 713! C5 Içel: Gülek Magara, 2150 m, Kotschy 70! The following collections are somewhat atypical: B6 Sivas (42 km N. of Gürün, 1700 m, Sorger 70-33-61! )tall growing with very large leaves; B7 Erzincan (Egin (Kemaliye), Iokardidagh, Sint. 1890:2853! )-hypanthia with plumose setae; B7 Erzincan (Sipikör Da., 1400 m, Balls 1537!) leaves very sparsely hairy. R. heckeliana is very complex and variable; subsp. heckeliana, a S.E. European taxon, may occur in N.W. Turkey as it is one of the parents of the following putative hybrid: R. heckeliana subsp. heckeliana x R. pulverulenta (Syn: R. pygmaea Bieb. var. olympica Clem., Sert. Or. 40 (1855)! R. glutinosa Sibth. & Sm. var. tomentella Boiss., Fl. Or. 2:679 (1872); R. orientalis Dupont var. olympica Déségl., Cat. Rais. no. 109 (1877); R. olympica (Clem.) Burnat & Gremli, Rev. Orient. 80 (1877) non Donn. (1811); R. bithynica Manden. in Notes R.B.G. Edin. 30:338 (1970)):-A2(A) Bursa: Bithynian Olympus (Ulu Da. ), 1850, dementi (type of R. pygmaea var. olympica)!